Compact size electronic drum set with special apple shape, made of silicon + plastic material, lightweight and portable, great musical gift for children. 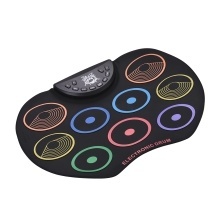 With 9 colorful drum pads, including 3 * Tom drum, 1 * snare drum, 1 * bass drum, 3 * cymbal, 1 * Hi-hat, providing you with excellent drum sounds; supports connecting foot pedal to make you playing more flexible. Without speaker, you need to connect it with external speaker or headphone via the 3.5mm audio output jack to enjoy the drum sounds; also with a 3.5mm audio input for connecting MP3/ smartphone/ tablet to play accompanying music. Built-in 3 drum style, 8 demo songs and 10 rhythm, which make your learn and practice easier and more interesting; supports recording and playback functions, volume and speed control. Dual power supply choices: 2 * AA batteries(not included) or powered by computer/ laptop/ DC 5V power adapter via the included USB cable.